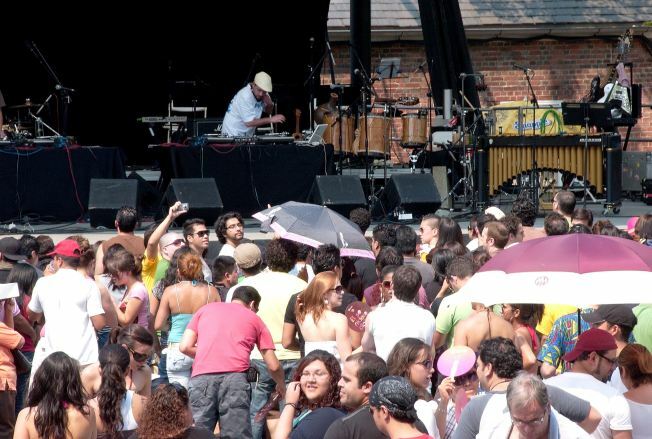 Fans attend Central Park SummerStage on July 12, 2008 for Julieta Venegas, Plastilina Mosh & DJ Bitman In Concert. The Central Park SummerStage season will begin June 12 with a free concert by the New York Pops, followed by more than 30 free music, dance, comedy, film and spoken word performances through mid-August, the non-profit City Parks Foundation announced. And despite cutbacks, closings, layoffs and mergers at other cultural venues, SummerStage is doing just fine. It plans a full lineup of free and benefit shows this summer and may even expand, David Rivel, the executive director of the City Parks Foundation told NewYorkology. Other performers on this summer's schedule include Wally Lamb on June 17; Fête de la Musique, (World Music Day) with Yannick Noah on June 21; Oumou Sangare on July 5; Bettye LaVette on July 24; M. Ward on August 1; and the Morphoses/The Wheeldon Company on August 14 and 15. Previously announced benefit shows include TV on the Radio and Dirty Projectors on June 5; 311 and Ziggy Marley and the Melody Makers on June 25; and Explosions in the Sky on June 30. Additional shows will be announced at a later date.